Abbotsford is known as the ‘City in the Country’. Fishing, hiking and mountain biking draw both residents and tourists year-round. Despite it’s countless outdoor activities, it rains, on average 174 days per year. As a result of this rainfall, a regular Abbotsford Gutter Cleaning Service is essential for maintaining your home or business. Clogged or overflowing gutters can cause structural damage and encourage algae growth. 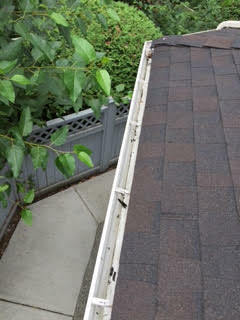 In addition, filthy gutters look awful and can ruin the look of any well maintained property. That is why our Abbotsford gutter cleaning is a must at any time of year. With the increase in rain throughout the Spring and Fall, gutter cleaning is vital for home maintenance. Keeping gutters free of leaves, needles and debris is just one of the many skills our gutter cleaning technicians bring to the job. We use high-pressure vacuums and mulchers instead of the traditional blower. This ensures all debris is completely removed from the gutters as opposed to blown all over your property or, worse still, onto the roof where rain and wind will force it back into the gutters. Our Gorillas pride themselves on a job well done. We want to ensure you are fully satisfied with the service without having to send you up a ladder to confirm it. 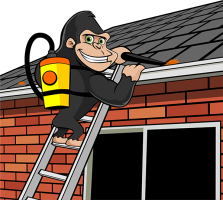 Outsourcing your Abbotsford gutter cleaning is meant to keep you off the ladder! You will never have to climb again, thanks to modern technology! Each of our gutter cleaning specialists is equipped with a smart phone allowing them to take before & after pictures. These pictures guarantee you peace of mind that the job is being done to the highest of standards.